Im delighted to be updating this page with the news that Molly has had her puppies. 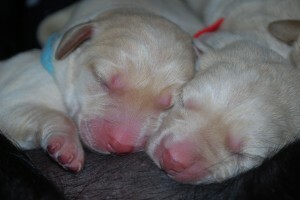 We have four yellow puppies (3 boys and 1 girl). Born 2nd/3rd April 2012. All the puppies are now in their “forever” homes! 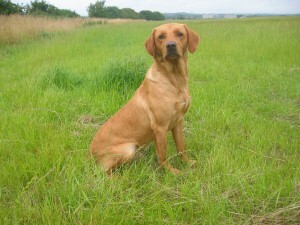 Molly is a fully working strain pedigree dog, Molly carries the colour yellow. Her health test details are: hip score of 3:5, a current BVA eye certificate. Molly is DNA tested for PRA and CNM, both of which are clear. The sire is Longcopse Bertie, at the time of mating FTW, now as of October 2012 a FTCH. Bertie is the perfect gundog and companion. He is great with children. Already he is producing lovely puppies both as pet and gundogs. He is a stunning dog with a lovely temperament. His health test details are: Hips Score 2:2, Elbows 0, a curent BVA Eye certificate. Bertie is DNA tested for PRA and CNM, both of which are clear. The proud owner of Bertie is Michael Brown who has been competing in the West Country for a number of years and is well known in the test/trial circuits. Working Test News. On April 7th 2012 Bertie and Michael attended the Windsor Charity Test. There were 27 teams comprising of 134 of the best competitors in the country. Bertie finished as top individual dog. A great achievment. This mating will result in the puppies being clear by parentage for PRA and CNM. This means they physically will NOT have PRA or CNM nor can they carry any genes to pass it on, should these puppy’s be bred from. 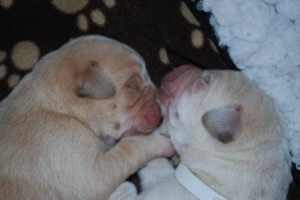 The puppies are KC registered. Please click on this page for further details of Molly’s health certificates, if you want further explanations of the health tests please click here. I am taking enquiries, for names to be on a waiting list. Please use the contact form if you have any questions! We are situated in Plymouth, Devon. I firmly believe the care our puppies are given in the first 8 weeks and our aftersales care puts us ahead of any Labrador puppies for sale in Plymouth!